I can't believe I'm a week late in posting about this amazing piece of art. The holy month is almost over, and if you want a bite of this ever so delicious cake, place your order now with Glaze. The Pistachio Lavender Cake. Some of you have seen this cake on their facebook page, and may have turned to look at the next picture, not knowing you have done the wrong move of dismissing it. It not only looks good! It tastes great! I wanted to order it for a special occasion. What better way than one of my besties birthday. I placed and order, urged her to pass by, very late at night, surprised her with it, candleless. But she was in awe. I knew we had very similar tastes especially in dessert. 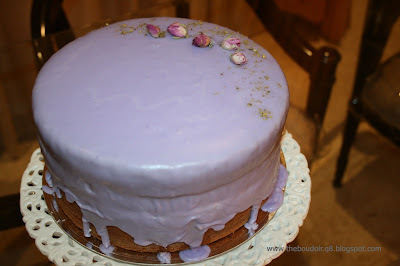 The icing is lavender glaze. 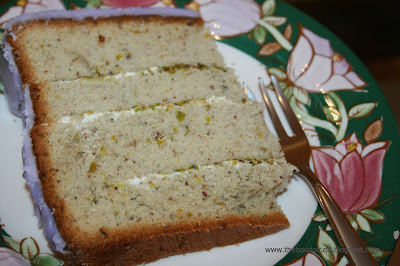 The cake is pistachio with a very light vanilla cream cheese filling. Its perfect very light. My sister thought this was old people's kind of dessert, she tended to put me down, but her actions showed otherwise, she ate the whole slice without showing any disapproving facial expressions. So its a winner. 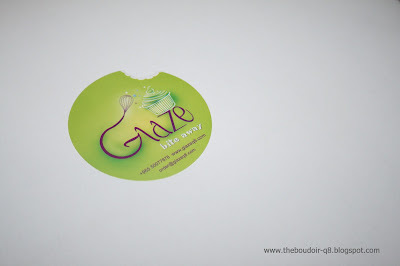 when it comes to desserts i like everything thats "old"